Matching outfits for Breezy and his baby daughter Royalty. Out of nowhere last month, news surfaced that Chris Brown was the father of a 9-month year old baby girl. While that unfortunately ended his relationship with longtime girlfriend Karreuche Tran, it did however start a new chapter in his life in becoming a first time father, which he looks to be fully embracing. Taking to his Instagram Thursday evening, Chris decided to show off his adorable, 10-month old baby girl, Royalty, for the very first time ever. Rockin’ matching outfits, Breezy wrote the caption “God has blessed me with my twin. #ROYALTY." 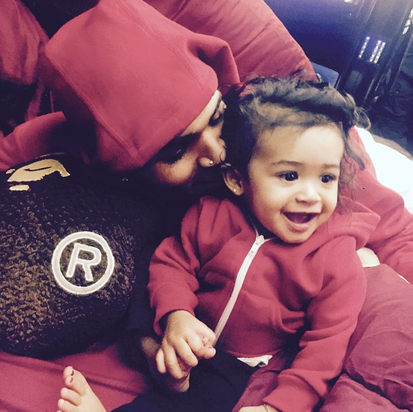 Check out the cuteness that is Breezy and Royalty below.